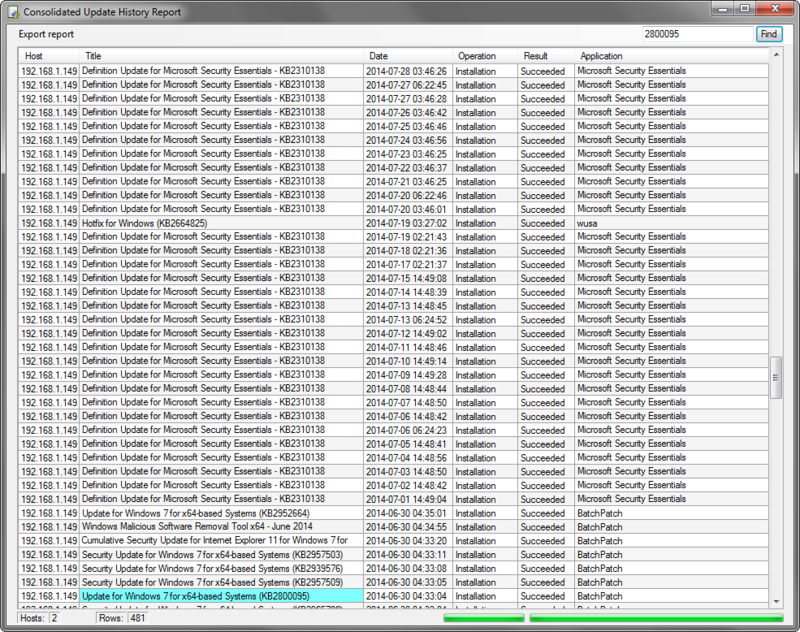 Windows administrators periodically need to check their systems to determine if a particular update has been installed. BatchPatch provides a simple way to scan for previously installed Windows Updates on numerous remote computers. You can use this facility to generate a consolidated report of the computers that have a particular update installed, or you can generate a report of all installed updates on all computers. It’s up to you. Add hosts to a grid in BatchPatch, and then highlight the desired hosts and right-click > Windows Updates > Generate consolidated report of update history. This will bring up the report settings window. Since the purpose of this tutorial is to search for a particular update, let’s examine our options for doing this. 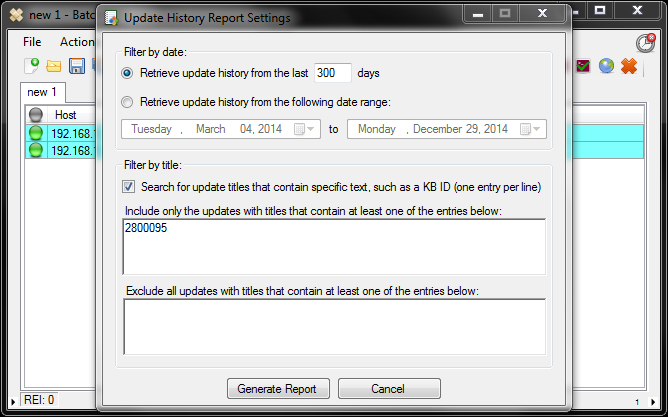 One option is we can use the “Filter by title:” section to specify which update we are looking for. Perhaps we need to find computers with KB2800095 installed. All we have to do is enter that particular ID into the ‘Filter by title’ field before we execute the search. In the screenshot below you can see I’ve set the search preferences to only include the last 300 days, and I’ve entered ‘2800095’ into the ‘Include’ section of the filter options. When I execute the search I expect to get a list of machines that had this update installed within the past 300 days. Click ‘Generate Report’ to begin the search process. When the search completes, we can see both of the machines that we searched had this update installed in the past 300 days. Pretty simple, right? The other option we have for obtaining this information is very similar, but in this case we would leave the ‘Filter by title:’ section blank. In this case we’ll simply retrieve all updates that have been installed on the selected computers during the past 300 days. Once we have this complete list, we can then do a search for the particular update in question, or we can sort by update title. As you can see in the screenshot below, I simply typed ‘2800095’ into the “Find” field, and the first computer with that update installed was highlighted. Continually clicking the ‘Find’ button will rotate through every search hit, as you would expect. That’s all there is to it. I told you it was simple! 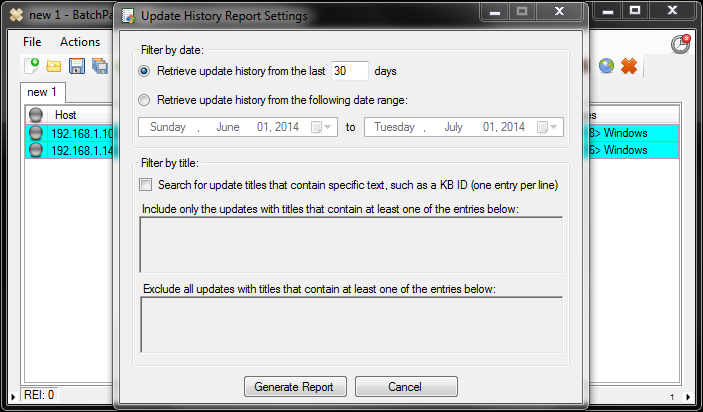 This entry was posted in Blog, General, Tutorials and tagged windows updates history, windows updates report. Bookmark the permalink. Both comments and trackbacks are currently closed.